Seal offs, or sealing fittings, are commonly found in hazardous locations. Industrial facilities where explosive vapors and dust are present must implement the practice to prevent the ignition and spread of such volatile components in the workplace. Why are Seal Offs Needed for Installations that are Not Rigid Pipes? Seal offs, or sealing fittings, are commonly found in hazardous locations. Industrial facilities where explosive vapors and dust are present must implement the practice to prevent the ignition and spread of such volatile components in the workplace. Below highlights the importance of seal offs and best practices during installation, including compliance with notable electrical regulations. One must first make sense of the working variables within a hazardous location in order to get a clear understanding of sealing fittings. A hazardous location is an area where a fire (or explosive hazard) may exist due to the presence of combustible gas, vapor, dust, liquids, fibers or flyings. The broad definition can be broken down into specific classifications, divisions and groups, created by various industrial institutions (more on this later). •	Class I: Gasses, vapors and liquids that can be present in explosive or ignitable mixtures (example: gasoline). •	Class II: Combustible dust that can be present in amounts that could produce potentially explosive mixtures, or dust of an electrically conductive nature (examples: flour and metallic dust, such as aluminum). •	Class III: Fibers or flyings that are easily ignitable but are not apt to be suspended in air in such amounts to produce ignitable mixtures (examples: nylon and cotton). Sealing fittings are ultimately designed to prevent explosions in a conduit system. Such systems are not vapor-tight, which allows dangerous gases to pass through, increasing the possibility of an explosion. During activation, a spark-producing unit (for example, a switch or a breaker) may ignite the vapors within the conduit system. Because of this, it is a must for businesses to install seal offs within 18 inches of any enclosure where arcing or sparking devices are present. In the event of an explosion, a seal off serves as a barrier that prevents dangerous vapors from making its way through the conduit system. 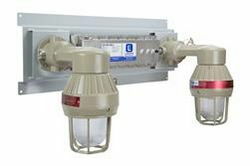 Containing the gases within the enclosure allows it to cool below external ignition levels, while dissipating through the explosion-proof components. Establishments that are keen on meeting specific industrial requirements may use a wide range of sealing fittings during application. A malleable iron seal fitting may be applied in the most extreme hazardous locations. The main component at work is malleable iron, which has high tensile strength and does not break easily under intense internal and external pressures. The option is favored by industry professionals due to its thin cross-section and closer turning radius (for seamless installation). Aluminum sealing fittings are ideal for installations where corrosion or weight is an issue. Usually found in offshore drilling rigs and marine settings, it can be used to mitigate corrosive conditions. Seal offs are essential in meeting various requirements and guidelines set forth by the NEC, with emphasis on rulings related to hazardous locations- where the presence of combustible gases, vapors and dust may lead to ignition or an explosion (Article 500). Chemical processing plants, grain mills and paint factories (just to name a few) are examples of settings where complying with NEC requirements is crucial to the safety of workers in the facility. Details on the specific regulations are elaborated extensively in Section 501-5 and subsections (a) through (f). •	Article 501.15(A)(4): A sealing fitting is required at the boundary where the conduit leaves a Division 1 location or passes from a Division 2 location to an unclassified location per 501.15(B)(2). The sealing fitting is permitted on either side of the boundary, and no union, coupling, box, or similar fitting is permitted between the seal and the boundary. However, approved explosion proof reducers are permitted to be installed in conduit seals. •	Article 501.15(B)(2): Conduit systems passing from an enclosure or room that is unclassified as a result of pressurization into a Class I, Division 2 location shall not require a seal at the boundary. •	Article 501.15(C)(3): Except for listed cable sealing fittings, the thickness of the sealing compound in a completed seal shall not be less than the metric designator (trade size) of the sealing fitting expressed in the units of measurement employed, and in no case less than 16 mm (5/8 in.). With the right tools and equipment, installing a sealing fitting can be done effortlessly. The first step is to insert and run the conductors through the fitting. Next, a fiber filler must be loaded into the piece. This serves as a dam that prevents cement from leaking while it is wet; where in a horizontal run, the filler is placed at both ends. In a vertical run, the fiber filling is only placed at the bottom end. The final step involves pouring the sealing compound into the piece at a depth that is equal to the trade size of the conduit with a thickness of at least 16 mm, as specified in NEC Article 501.15(C)(3). After the compound has settled and hardened, a removable close-up plug must be screwed into the pouring opening.